Experience sweeping panoramic views of the Pacific Ocean and Maui's offshore Islands while zipping through the West Maui mountains on eleven incredible lines. 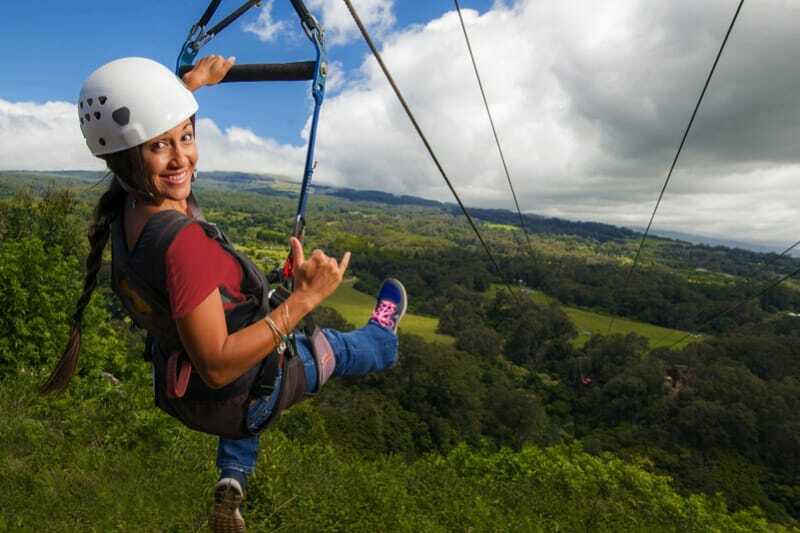 The adventure begins with an exciting ride deep into the rugged valleys of Mount Kahalawai (the West Maui Mountains), with sweeping views of West Maui, Molokai, Lanai, Kahoolawe and the Pacific Ocean creating the perfect backdrop for each of the Kaanapali zipline crossings. Once there, eight amazing zip-lines allow you to experience this piece of wild Hawaii. Zipping high above a mountain stream, and over two different valleys, visitors experience the excitement of seeing an otherwise inaccessible area of Hawaii and soaring high above it! Overlooking Maui's historic Lahaina town on the right and with incredible views of the West Maui Mountains highest point, Pu'u Kukui, on the left, photo opportunities abound. The adventure lasts approximately 3.5 hours, including all eight exciting zip-line crossings, rugged off-road shuttle ride, and meal served at the private valley-edge location. 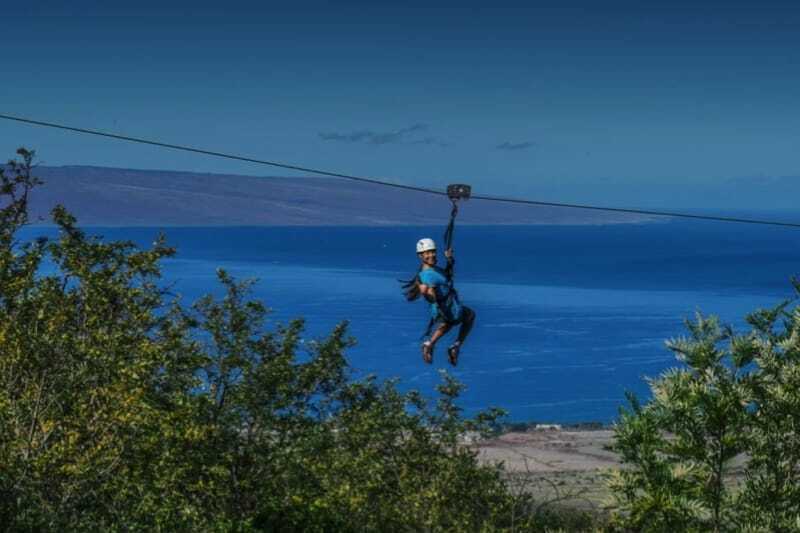 Zip-lines: 11 lines soar above Ka'anapali's remote coastal landscape. Each line opens up views of untouched Hawaiian lands and miles of blue Pacific Ocean. Viewing Platform: After line 4, we'll take a little detour and head over to our viewing platform that overlooks a 1,000-foot valley, the West Maui Mountains, and, of course, the Pacific Ocean. A Cultural Experience: Our terrific guides will uncover Hawaii's rich history and keep you laughing most of the tour - it's a fully Hawaiian experience. Dual Racing Lines: You can challenge your siblings, spouse or friends to an exhilarating side-by-side racing experience down our Ka’anapali dual zip-line. We have a generous cancellation policy. 24 hours or more before your tour and you will receive a 100% refund. Less than 24 hours, no refund. Customers MUST be 10 years or older, all customers under 18 must have a legal guardian sign for them. Customers MUST weigh between 80 & 260 lbs. This Policy is STRICTLY ENFORCED, for your own safety. Customers will be weighed on site if there are questions and WILL NOT be provided a refund if they are outside the limits. Customers MUST be physically able to hike 1 to 2 miles at elevation over uneven terrain. All customers are REQUIRED to sign a release and waiver of liability prior to taking the tour. Absolutely NO SMOKING is allowed on tour. We do require everyone to arrive (30) minutes prior to their tour time. We have a check-in office at the Fairway Shops in Ka'anapali for our Ka'anapali tours and Ka'anapali Zip n' Dip tour. Driving directions are included with your confirmation email. For your safety, we require that you wear shoes with a fully enclosed heel and toe - tennis/athletic shoes or hiking type shoes are best. No hiking sandals, Teva's, Keene's, Crocs, Tom's, Vibram FiveFinger shoes or Skecher Shapers allowed on the course. Shoes must be snug to your foot, no loose fitting or un-laced Converse style shoes allowed. Do I have to wear long pants? Yes, you may bring your camera/phone along to snap photos along the way. Your guides will also take many photos of you zipping. All the pictures from your tour will be available for $15. You can also rent a Go-Pro camera. Guests MUST be 10 years or older. Anyone under the age of 18 will be required to have a completed waiver and have a responsible adult sign the form for them. I'm going scuba-diving the day before my tour, is that ok? Customers MUST NOT have been scuba diving within 24 hours of scheduled tour time for all courses. Safety is our top priority, and it shows. 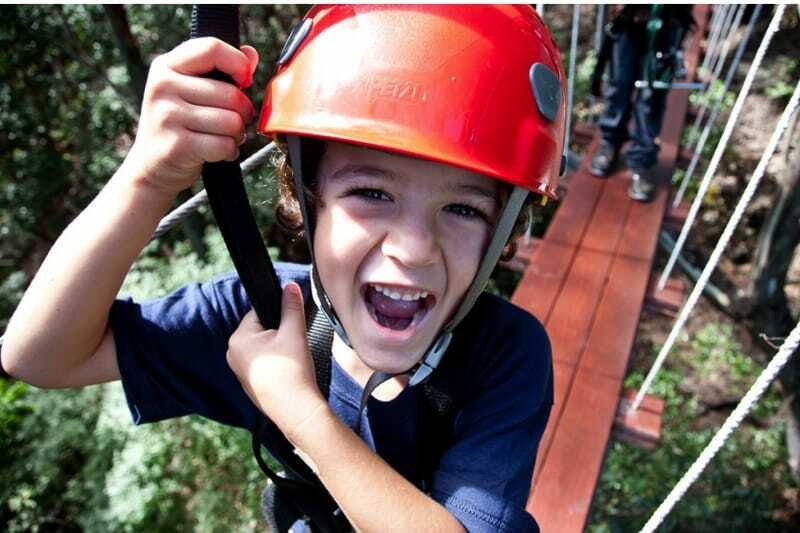 Over 3 million zipline crossings - we've set the industry standard in zip lining safety. All equipment is tested to hold at least 5,000 lbs. Each zipline has a minimum breaking strength of over 26,000 lbs. We believe that your safety starts with guides that have a comprehensive understanding of the ziplining industry and safety best practices.Each of our guides go through an 80-hour training process, and a period of ?assistant guiding? ?a time where ?junior? guides are paired up with more experienced guides to get on-course training and experience. The industry standard for this process is a short 40-hour training process. Every day, our trained staff thoroughly inspects all the ziplines, platforms, trails, and equipment of each course. And at least once a year an accredited ACCT inspector conducts a comprehensive review of each course, equipment, and all current practices. Kids 15-17 years old need an adult signature on their waiver but can take part in our tours without an adult in their group on tour EXCEPT for Ka'anapali Zip n' Dip tours! Example: 15 & 16 year old friends can zip without a parent or adult in their party as long as they have an adult sign the waiver for them at check-in first.Kids 14 years and younger need to have an adult on tour with them and an adult must sign the waiver for each child. The adult can be a parent, relative, or friend and must be 18 years or older. Ka'anapali Zip n' Dip tours: Requires 1 adult to participate with each party regardless of the age of the minors. Example: Jones party of 2 (15 and 16 year old's) cannot go on 4 line Zip n' Dip without their 18 year old sibling or another adult. We had an awesome zipline adventure with Dillon and Katrina on Maui's 11 line course. They were fabulous guides who were friendly, fun and had a great sense of humor while making us feel safe. I highly recommend!! We booked an 8-line Zip course for the Ka'anapali location. You meet at the store front, then two of the guides (ours were Gavin and Bobo) drive you up the mountside in a 15-person van. The van ride up the mountain is about 20 mins one way. It is an EXTREMELY bumpy ride due to the rough terrain. Part of the experience I guess. You stop halfway to put on the gear and to store away your belongings. They also provide you with a small fannypack so that you can bring your phone/camera/other small things. Definitely wear closed toe shoes, there is a bit of hiking (easy hiking) involved as you go from zip line tower to zip line tower. Some of the zip line towers are connected, others require you to hike for a few minutes to the next tower. Our guides were funny, shared local restaurant knowledge with us, and overall provided a bit of comedic relief/entertainment. The zip line process is very safe and secure, I never felt nervous about my safety. Next time I'm trying the 11-line one! My husband and I chose the 8-line zip-line tour during our stay in Maui. This was our first time zip-lining, so we didn't really know what to expect. We were both a little nervous about it initially, but in the end we had so much fun! Our guides Bobo and Kevin were hilarious! They were cracking jokes the whole time, making our whole group feel at ease and getting us excited. They always prioritized safety, and they were there to send us off and catch us every step of the way. They also were very knowledgeable about the island and its history. Additionally, the staff at the main office was very friendly. You can tell that everyone enjoys what they're doing, which makes you more excited about the experience. The ziplining was over a valley with beautiful views of the island. With each line, you could see most of Ka'anapali, the ocean, and Lanai in the distance. Definitely wear comfortable clothes that you don't mind getting dirty, because the natural red dirt will get all over. You're also able to bring your phone/camera with you to capture all the views as well as some great action shots of the actual ziplining. Overall, it was a memorable experience, and we would definitely do it again!